The Meera brand emerged in 1998 where its doors first opened in North West London. The Meera name is known as an iconic brand that has served its passion to cater pure vegetarian foods for clientele all around the world including prestigious, religious and cultural events. The company has been famed for its authentic, and specialised Indian cuisine. 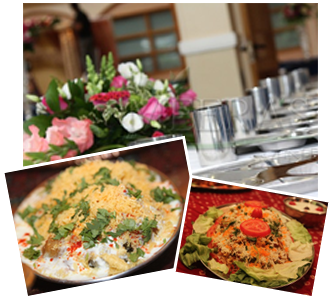 It all started from Meera Catering which specialises in catering services for weddings, parties and corporate events. Having been open for more than 15 years the expertise and brand image of Meera helped revolutionise and adapt the emerging market with its new expansion in fast food takeaways otherwise known as Meera Xpress. Meera Xpress retail branches have developed over the course of the past decade and embarked into a extremely ambitious route to open a chain of fast foods within London. Moreover, not long ago Meera group launched their uniquely decorative restaurant aiming to bring traditional India into the western world. We aim to offer you the choice to taste the best cuisine's from traditional Gujarati foods to Punjabi and Indo Chinese thus enhancing the flavours and textures complemented by our classical Indian recipes from around the world. With our team we look to build a legacy and continue with our fresh everlasting ingredients. Here at Meera group our aim is to keep all customers happy and stick by our ethos "Love all serve all". "They say never trust a skinny chef, but the fact is, to stay healthy when you're a chef means you have to work twice as hard"